This entire drive around the Olympic national park and forest is scenic, cool, and not crowded, but the food is not cheap. If you Vanabode in with coolers stocked you could easily have a fantastic time for 1-4 weeks around this entire peninsula. Water temperature is in the low 50 degree range. The clouds, storms and offshore fogs do give you an interesting feeling even though it may not be completely beautiful. Once you get to the upper middle of the Olympic National forest the campground prices drop to $10 to $15 a night instead of $25 to $40. Olympic National Park and the surrounding Campgrounds are $14 to $30 a night so we avoided them for the most part. They were all crowded with families mainly in RV's, each with two to three screaming children and a dog or two. We did pull into the day use areas and the campgrounds to hang out, hike and shower. If your budget can handle it some of campgrounds can be quiet enough to be fun, depending on the day of the week and the season. 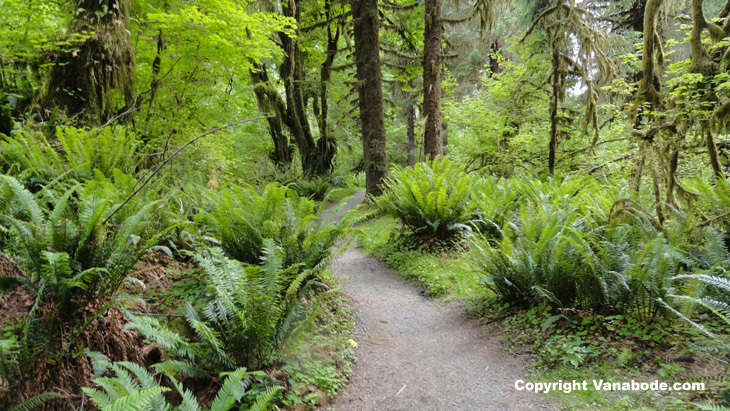 With almost a million acres of coast, forests and mountains, 95% of Olympic National Park is designated as wilderness. Which means if you want complete solitude then nobody's stopping you. There are more than 600 miles of trails all while gazing over hundreds of thousands of acres. And if you are like the majority you will be going around with the yearly count of about 3 million park visitors traveling and hiking the same roads and short trails as you. So it pays to be polite and friendly at all times. Keep in mind we are giving a great review on these Washington state parks based on our specific dates of travel. We are hitting them in mid June, in the middle of the week most times when most people are working, and the weather has been luckily sunny at least 60% of each day. The locals are raving about how nice it is and to us it is just barely so because we are used to the clear skies in the states out West like Utah, Nevada and Arizona. Here even 3-4 hours of sun a day is cause to get out and hike, take the dogs for a walk, visit the waterfronts, etc. Consequently we do not recommend this part of the country for a Vanabode run except during June, July and early August. These months are the best for weather and temperature. Of course if you are a hardy cold weather lover then the west coastal side of Washington could be Vanaboded the rest of the year. The advantage of course is you will have little competition for hiking and camping spots. For me it would be unbearable. Above: A very moody picture of a marina that we took while traveling the north coast of the Olympic Peninsula. We have never seen so many marinas outside of Florida. But with all the marinas we barely saw any boats driven around enjoying the water or fishing in the Pacific or in the Straight of Juan De Fuca. We thought that a little odd. Traveling highway 101 on the east side of Olympic National Parks there are numerous private marinas, golf clubs, and decent size resorts that you can become a member of or lease moorage space from. Moorage at the marinas will typically get you an assigned parking spot so you could theoretically bring in a day use boat like a kayak or small motor boat and then Vanabode camp out of the parking spot while enjoying the swimming pools, neighborhoods, showers, marina life, food and stores connected to each one. The marinas I saw were very well set up offering customers huge picnic tables mounted on docks extending way out over the bays, huge aluminum light weight carts for moving your supplies from car to bat, massive commercial quality grills, and 12 foot long stainless steel counter tops with built in sinks for cleaning fish. Of course if you are a boater then this is ideal as the waters are ripe with marine life for fishing and viewing. The waters offer visibility of 12 to 40 feet in some places so scuba diving is practiced here as well during these warmer months. 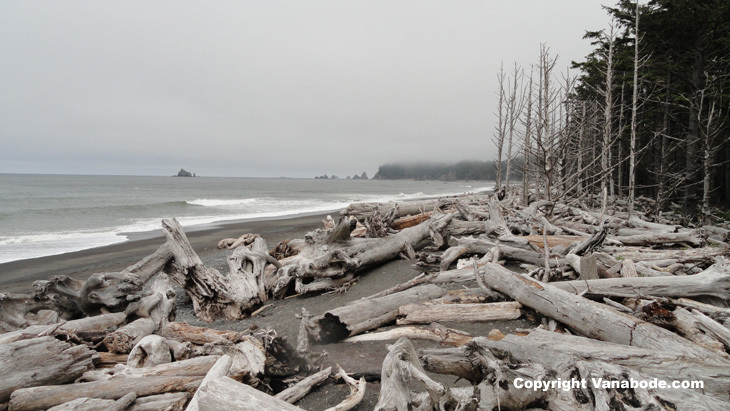 Above and Below: You can see in these pictures the abundance of the driftwood along the black sand of Rialto Beach. About 1.5 miles north are arch and tidepools at Hole-In-The Wall rock formation. This is a very popular beach hike destination and typically the reason for the crowds here. 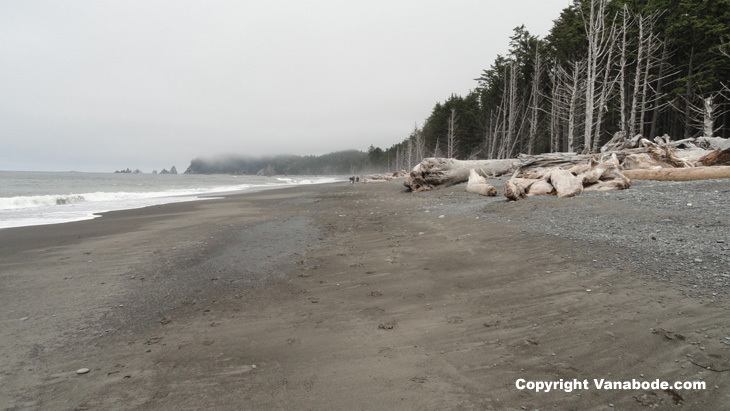 Unfortunately, our time spent in Olympic National Park both inland and on the coast was overcast, cool and very windy. The majority of the coastal hikes and points of interest dotted on the parks' map are harder to get to. Of course there is a lovely road that travels west from Forks to the Pacific ending at Rialto Beach and First Beach. But points north and south of these popular beaches renders you traveling by foot. But if solitude is what you are looking for then happy traveling, no one said it would be easy, not even during low tide. We just parked in the beach access lots of Rialto Beach to see Hole in the Wall rock which is fantastic during low tide but almost completely unworkable during high tide. The black and gray sands are soft and wet but the beach is covered with smooth blue-grey pebbles, fascinating. It's extremely crowded here during the summer but worth the trip and a great stopping place if you need a restroom, want to snack at a picnic table or want to camp for the night. The beach is full of larger than life giant dead trees, modestly called driftwood. These trees have been washed ashore by the ocean over many, many years. The driftwood is a great playground for you and your kids, you will be climbing on and jumping off horizontal trees for hours. 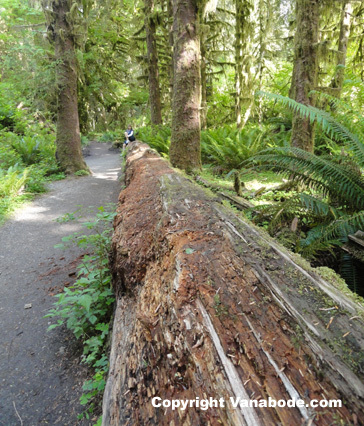 Above: A couple of fun pictures to take to show the great length of the trees in the Hoh Rainforest. Above: Straddling the nurse tree is a colonnade of Sitka spruce and Western Hemlock, six in all. Their buttressed roots prevent them from falling over. 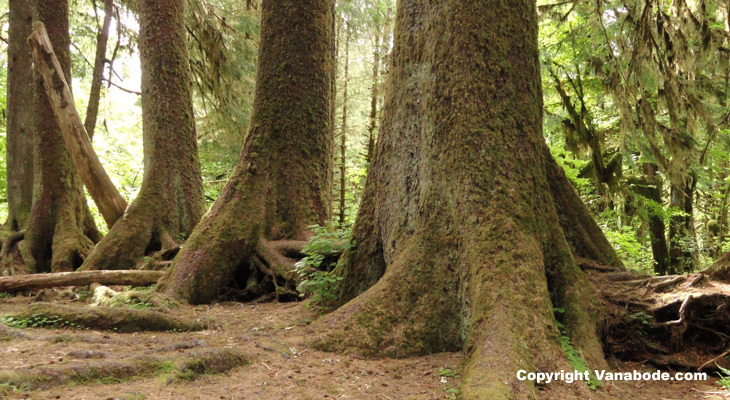 The Hoh Rain Forest is one of the only temperate rain forests in the world that is more than 10 miles inland. At the gate we had to pay $15 for a 7 day pass for access to all the other state parks. The hikes were super easy, very scenic and well worth the fee for such a long unlimited visit. The fee does not include overnight camping spots but you could do that at various points throughout the parks for about $15 to $25 depending on location. We never paid to camp here. Above: The Spruce Nature Trail in the Hoh Rainforest is a little over a mile with some elevation issues but an easy trail nonetheless. 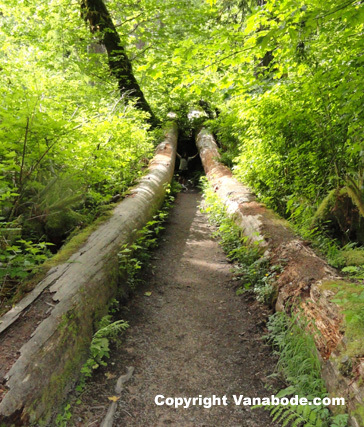 This trail parallels the Hoh River for a bit before heading back into the rainforest. I think I am just going to stay on the trail." here in the Olympic National Park Washington.